Hundreds of UK ‘cross fans make the annual pilgrimage to the sand dunes of Koksijde this weekend to cheer on the five British riders in the fourth round of the UCI World Cup. National champion Jody Crawforth makes the short trip across the Channel to join Belgium-based Ian Field in the men’s race. All three of the top British women start, with Helen Wyman, Gabby Day and Nikki Harris tackling the unique seaside course and its treacherous deep sand. Wyman is looking a good bet for a podium position if recent form is anything to go by, having given former World champion Hanka Kupfernagel a run for her money in Germany last weekend. Wyman faces all three of last year’s medal winners, however, including Kupfernagel, American Katie Compton and Holland’s Daphny van den Brand, plus reigning World champion Marianne Vos. “Vos being on the front row might make a difference to the start. As you get off the road, you are going straight up a sandpit, and that is always crazy on the first lap. It splits the race up straight away,” said Wyman. 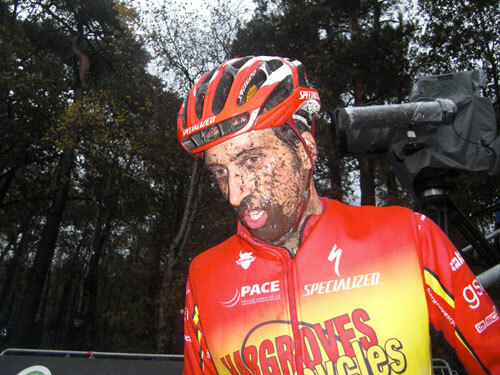 There are a few reasons why Koksijde is such a big draw for British fans. It is a mere half hour drive from Calais, making it eminently feasible to do the whole thing in a day. As cyclo-cross races go, it is pretty unique. And – perhaps best of all – it always falls on the same week as the Ghent Six, so track fans can make a weekend of it. Seats are most likely now sold out – although do check on the link below – but standing in the track centre can be bought on the night for both Saturday or Sunday. Where to stay De Panne is a perfect base if you’re heading to the cross. There’ll be time for a hot chocolate and Belgian waffle on Saturday morning before heading to the race. If you’re going to the Six Day, go to Ghent. Make sure you stay in the centre of town. It’s busy and lively even in winter. There are loads of hotels in Ghent, to suit all pockets. Take your bike. Every direction out of Ghent takes you over roads made famous by the legends of Classic cycling. Head for the paths that run alongside the River Schelde – routes that all riders in the Ghent area use for training. Or go south to the hills that make the Tour of Flanders. There are plenty of sign-posted routes to guide you. And if the weather is lousy, it only adds to the authentic experience. Visit the Tour of Flanders museum at Oudenaarde. This isn’t just one for the anoraks. It gives an insight into the scale and passion of cycle sport in Belgium. There’s memorabilia galore, including old jerseys, bikes, trophies and posters. Just be careful – it’s possible to spend a fortune in the shop. Maps of the popular bike routes are available here too. Eat, drink and be merry. Of course your evenings will be spent at the velodrome but if you are in town for lunch there are plenty of places to eat. One of our favourites when in Ghent is the Monopol Restaurant in Korenmarkt. It’s reasonably-priced, the steak is as soft as melting butter, the moules-frites are among the best in town and the rabbit stew is tremendous. For a swift half before heading to the track, try the tiny Bierhaus next to the canal. All the favourites – Leffe and Duvel – are here, but try Orval. Another great bar is the Dulle Griet in Vrijdagmarkt.